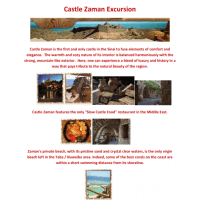 Castle Zaman is the first and only castle in the Sinai to fuse elements of comfort and elegance. The warmth and cozy nature of its interior is balanced harmoniously with the strong, mountain-like exterior. Here, one can experience a blend of luxury and history in a way that pays tribute to the natural beauty of the region. Castle Zaman features the only "Slow Castle Food" restaurant in the Middle East. Zaman's private beach, with its pristine sand and crystal clear waters, is the only virgin beach left in the Taba / Nuweiba area. Indeed, some of the best corals on the coast are within a short swimming distance from its shoreline. This Ad has been viewed 373 times and got 1 reply.